A dying serial killer named Charles Lee Ray transfers his soul into a 'Good Guy Doll,' which winds up in the hands of a six-year-old boy named Andy. Now, Chucky wants to transfer his soul out of the doll and into Andy so he can live again, and he is willing to kill anyone who gets in his way. Dolls can be very creepy. We think it's the soulless looking eyes that do the trick. They have been a go-to antagonist in horror movies for quite some time. Chucky may not be the first killer doll in a horror movie, but he is certainly one of if not the most memorable. Director Tom Holland, no, not THAT Tom Holland, is known for his other horror films like "Fright Night" and "Thinner." He takes a bit of a twist on the standard eighties slasher and adds a supernatural element by making the killer a possessed two-foot tall doll. The story is about a serial killer named Charles Lee Ray, played by Brad Dourif, who, in a desperate attempt to save his own life after being fatally wounded, transfers his soul into a 'Good Guy Doll.' He's just lucky he wasn't around a display of Barbies or Cabbage Patch Kids because that may have changed the entire tone of the movie. The doll eventually becomes the property of a six-year-old boy named Andy, played by Alex Vincent, who received it as a birthday present from his mother Karen, played by Catherine Hicks. She unwittingly purchased the possessed doll from a homeless peddler in the alley behind her work, which is always the best place to find discount children's gifts, didn't you know?! 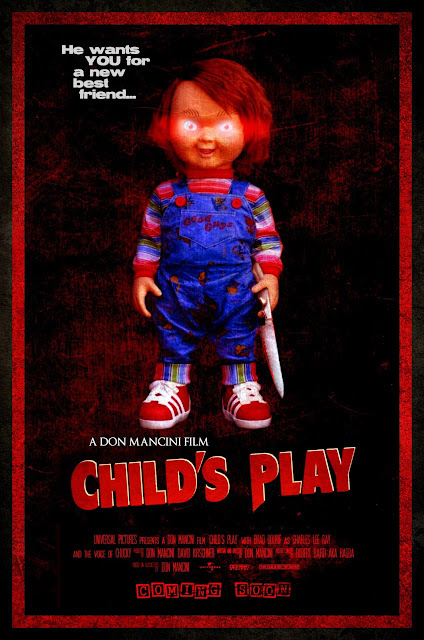 "Child's Play" is a fun, slightly tongue in cheek horror film that we love watching during Halloween time. It has plenty of gore and tons of horrific moments, the most memorable of which involves a voodoo doll and the breaking of some limbs. There is a hefty dose of absurdity to everything that happens here, and as the series went farther and farther along, it started to embrace those comedic elements more and more. This first installment does have its fair share of humor beyond the fact that full-grown adults are constantly wrestling a very small doll. Chucky himself delivers a lot of quips and insults that certainly make the audience chuckle. The final conflict between Chucky and Andy is extremely unsettling and really gross. The acting in this film isn't great, but it's actually not all that bad either. Catherine Hicks and Chris Sarandon, who plays Detective Mike Norris, are very capable performers. Brad Dourif also does some awesome, now iconic voice-over work as Chucky. The plot is as simple as they come and the film does have the occasional jump scare, but it doesn't really overdo it. In the end, "Child's Play" is a good damn time (before the series got wildly out of hand). Fans of cheesy 80s horror will rejoice while watching this film.